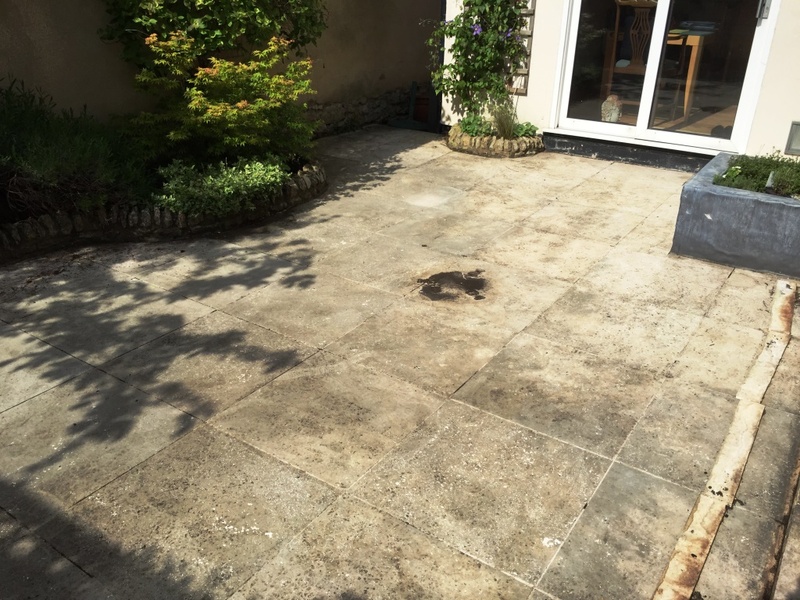 This was a job I did earlier in May this year where I was asked to clean this lovely Limestone patio installed at the rear of a house in Haddenham near Thame on the Oxfordshore borders which had succumbed to the ravages of the English winter weather and was far from looking its best. 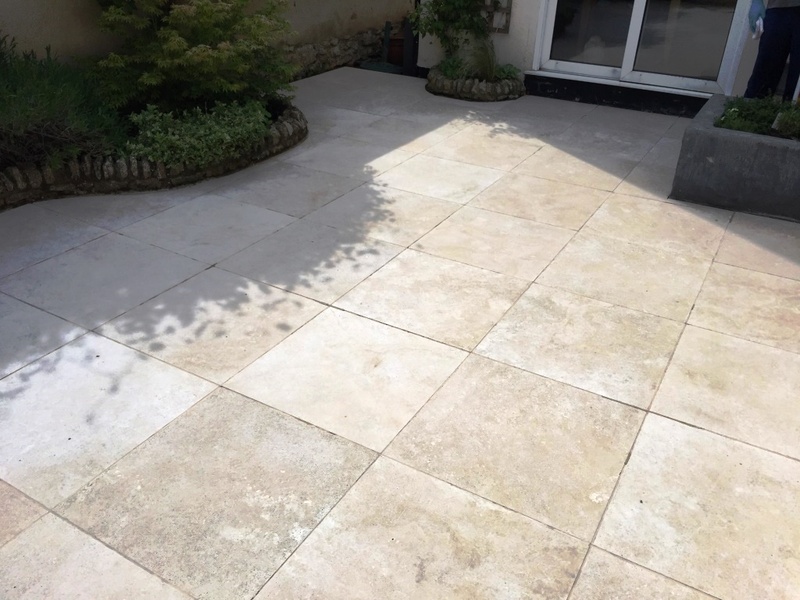 As a Tile Doctor and carpet technician I have invested a lot in powerful high pressure machinery that can make light work of interior and exterior installations so taking on this patio was not a problem and it was nice to work outside for a change. On arrival I set-up the high pressure equipment and then proceeded to pressure wash the patio in order to get the worst of the dirt out of the tile. 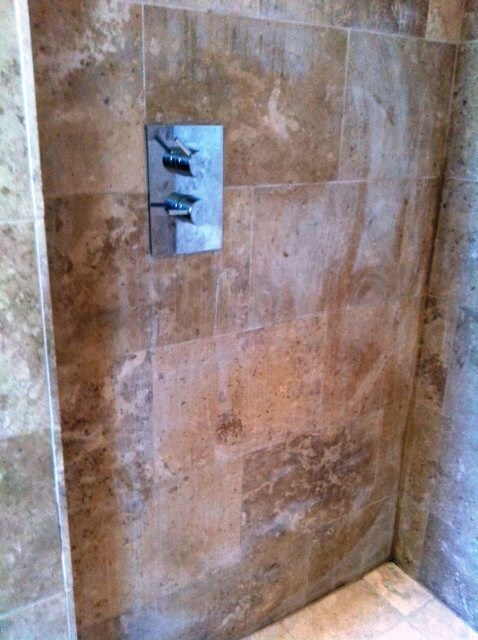 Then I soaked the tiles in a strong dilution of Tile Doctor Pro-Clean which was left to dwell for thirty minutes. The next process was to use a deck brush to scrub the cleaner into the stubborn areas and then rinse the patio with clean water which was then removed using a wet vacuum. 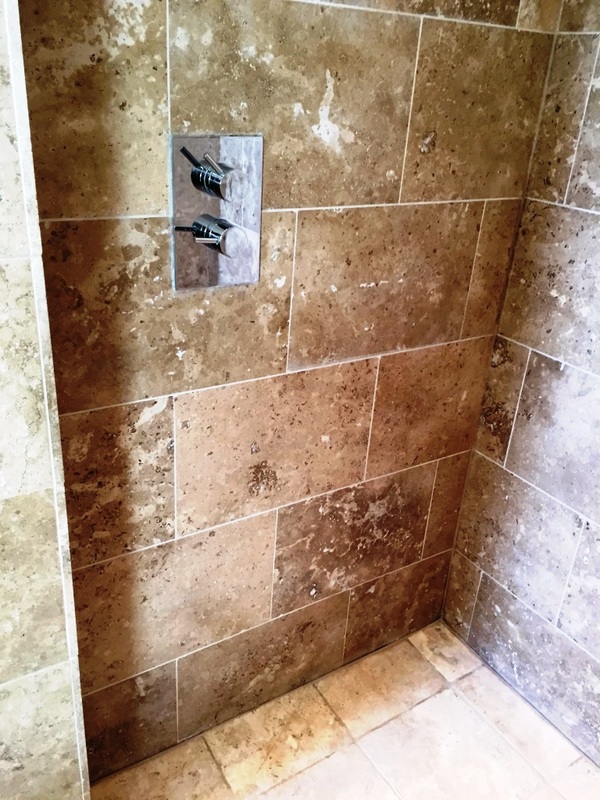 After letting it dry I then had to re clean the worst areas again following the same process until I was satisfied with the condition of the tile. The patio soon dried in the warm sun and later that day I was able to seal it using a couple of coats of Tile Doctor Colour Grow which is a colour enhancing impregnating sealer that can be used internally and externally, it works really on Limestone and did well to bring out the natural colours in the stone. The owners of the house were very pleased that the wall was not ruined and left the feedback below, I would imagine the cleaning company was relieved that the problem had been resolved. I would just like today how brilliant Barry Woodward was in coming to my help. His knowledge and professionalism was second to none. The problem was solved so quickly. Thank you Barry! 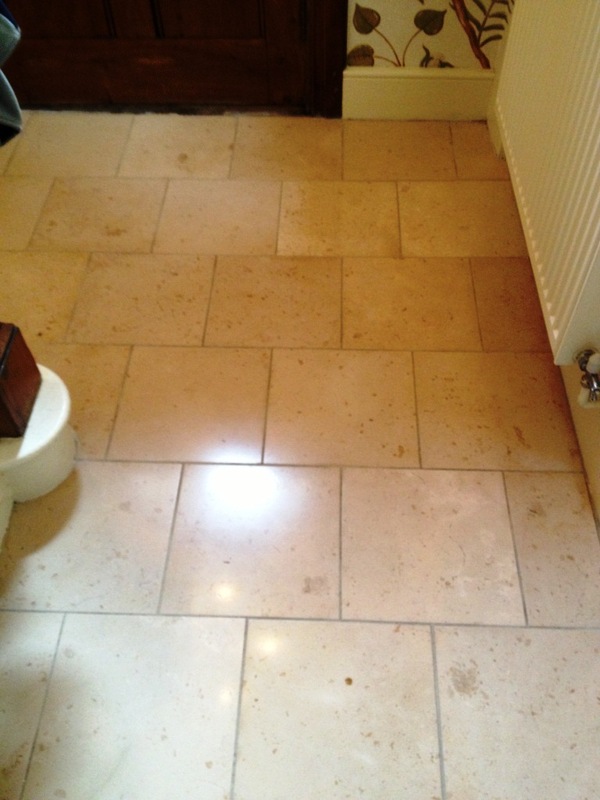 Photograph below of a very dirty Limestone tiled kitchen floor at a house in Henley on Thames, the sealer had worn off some time ago and now the tile was trapping dirt that was proving very difficult for the home owner to remove. 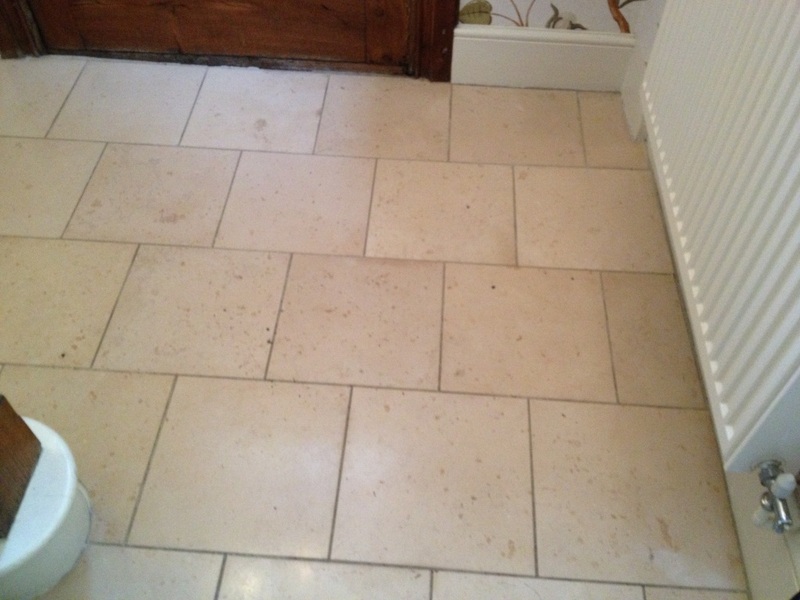 I do love floors in this condition as they make great adverts for how well Tile Doctors can restore your floors. 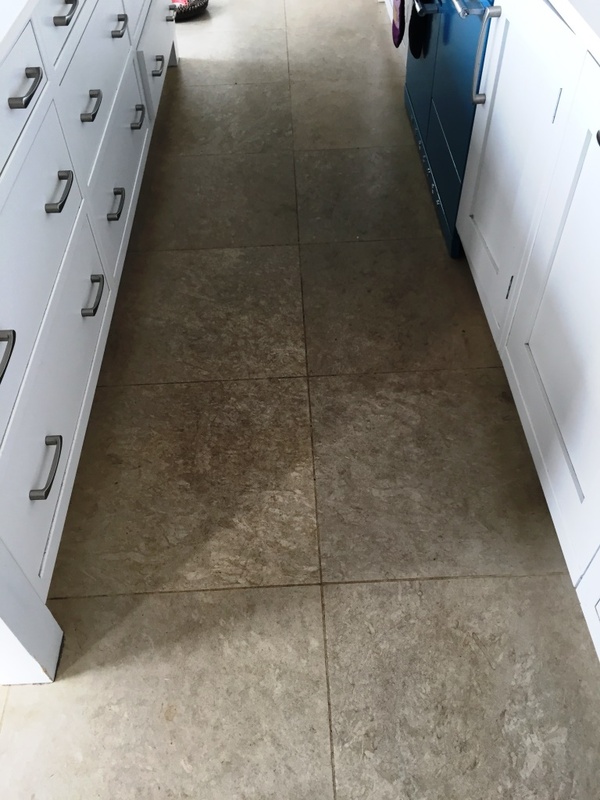 To restore the floor back to its original condition I used a set of burnishing pads which are encrusted with industrial diamonds and come in four different grades from coarse to very fine. Applied with a little water the coarse pad strips the floor of dirt and old sealer whilst the remaining pads which are a finer restore the polished surface. Between each pad you need to rinse the floor with fresh water which is removed with a wet vacuum before finally being left to dry overnight. 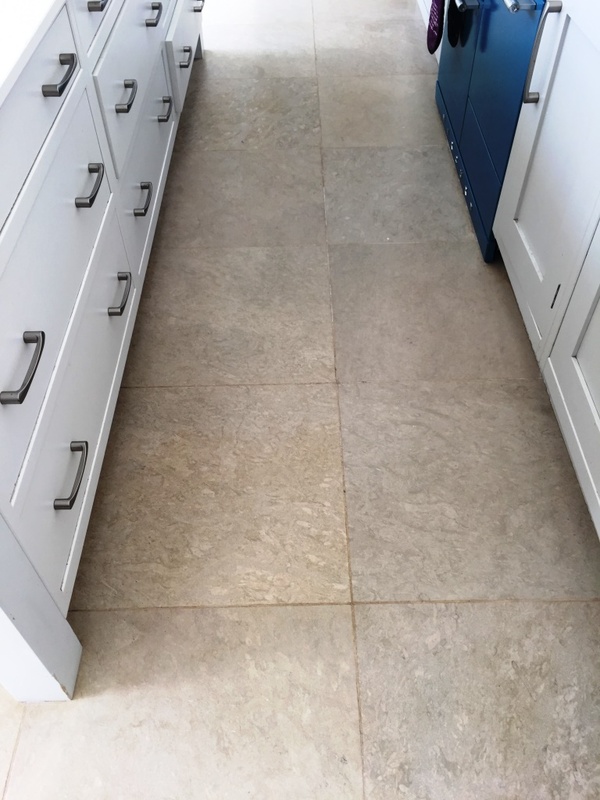 The next day I check the floor was dry which it was and then proceeded to seal the Limestone with two coats of Tile Doctor Colour Grow which is a colour enhancing impregnating sealer which occupies the pores in the natural stone to provide maximum stain protection.